Readings: Deut 26:4-10; Rom 10:8-13; Lk 4:1-13. 1/ First Reading: NAB Deuteronomy 26:4 The priest shall then receive the basket from you and shall set it in front of the altar of the LORD, your God. 5 Then you shall declare before the LORD, your God, 'My father was a wandering Aramean who went down to Egypt with a small household and lived there as an alien. But there he became a nation great, strong and numerous. 6 When the Egyptians maltreated and oppressed us, imposing hard labor upon us, 7 we cried to the LORD, the God of our fathers, and he heard our cry and saw our affliction, our toil and our oppression. 8 He brought us out of Egypt with his strong hand and outstretched arm, with terrifying power, with signs and wonders; 9 and bringing us into this country, he gave us this land flowing with milk and honey. 10 Therefore, I have now brought you the first fruits of the products of the soil which you, O LORD, have given me.' And having set them before the LORD, your God, you shall bow down in his presence. 2/ Second Reading: NAB Romans 10:8 But what does it say? "The word is near you, in your mouth and in your heart" (that is, the word of faith that we preach), 9 for, if you confess with your mouth that Jesus is Lord and believe in your heart that God raised him from the dead, you will be saved. 10 For one believes with the heart and so is justified, and one confesses with the mouth and so is saved. 11 For the scripture says, "No one who believes in him will be put to shame." 12 For there is no distinction between Jew and Greek; the same Lord is Lord of all, enriching all who call upon him. 13 For "everyone who calls on the name of the Lord will be saved." 3/ Gospel: NAB Luke 4:1 Filled with the holy Spirit, Jesus returned from the Jordan and was led by the Spirit into the desert 2 for forty days, to be tempted by the devil. He ate nothing during those days, and when they were over he was hungry. 3 The devil said to him, "If you are the Son of God, command this stone to become bread." 4 Jesus answered him, "It is written, 'One does not live by bread alone.'" 5 Then he took him up and showed him all the kingdoms of the world in a single instant. 6 The devil said to him, "I shall give to you all this power and their glory; for it has been handed over to me, and I may give it to whomever I wish. 7 All this will be yours, if you worship me." 8 Jesus said to him in reply, "It is written: 'You shall worship the Lord, your God, and him alone shall you serve.'" 9 Then he led him to Jerusalem, made him stand on the parapet of the temple, and said to him, "If you are the Son of God, throw yourself down from here, 10 for it is written: 'He will command his angels concerning you, to guard you,' 11 and: 'With their hands they will support you, lest you dash your foot against a stone.'" 12 Jesus said to him in reply, "It also says, 'You shall not put the Lord, your God, to the test.'" 13 When the devil had finished every temptation, he departed from him for a time. People are surrounded by worldly falsities; for examples, they attribute what they have to gods which were made by human hands; or they think they can live without God’s, parent’s or others’ help, etc. However, God doesn’t let people be confounded in falsities, He gives people the intellectual light to think and the unlimited treasure of the Scripture so that they may recognize the truth and worship Him. Today readings concentrate on the recognition of God’s blessings and people’s corresponding worship of God. In the first reading, Moses commanded the Israelites to memorize forever the two events which God had done for them which are the exodus from Egypt and His guidance of people into the promise land. They must give thanks to God by offering their first fruits for Him. In the second reading, Paul gave the Romans the important advice: in order for God to answer their prayer, they must belive Christ in their heart and confess him with their tongue, not only by being the Jews. In the Gospel, Jesus taught us three important lessons through his three times of being tempted: First, people can’t live only by bread alone. Secondly, people must worship God above all things, not any of His creatures. Lastly, people have no right to test God. 1/ Reading I: God is the One Who bestows all blessings on people. 1.1/ The remembrance of past helps people how to live in presence: Two very important events in the Israel’s history are the exodus from Egypt and the entrance into the promise land. (1) The exodus from Egypt: The Israelites lived in Egypt from the time of Joseph and Jacob’s children. After Joseph passed away, the Israelites were maltreated as slaves by king Pharaoh and his officers. They cried out to God and He sent Moses and Aaron to them to lead them out of Egypt. In order for king Pharaoh to let them go, God used “His strong hand and outstretched arm, with terrifying power, with signs and wonders” on the land of Egypt. (2) The entrance into the promise land: God not only brought the Israeltites out of Egypt but He also prepared them during forty years of wandering in the desert before leading them into the land of Canaan, the land full of milk and honey as He promised to their forefathers. During these forty years, He purified them from all evil tendencies such as: complaining, glutonny and idol worshipping. 1.2/ To respond to God’s love: The beginning and the end of today passage, Moses commanded people to offer the first fruits of the land which God gave to them. The priests shall receive and put them before God’s altar. The first fruits of human beings and also of the land are the most precious; but they must sacrifice to offer them for God; not because God can eat them, but for people to recognize what God has done for them and thank Him. 2/ Reading II: All those who believe and call upon Christ’s name shall never be despair. Paul wanted to emphasize two things in this verse: First, God is the principle agent, He put the word into people’s heart. Secondly, Paul is only the co-operator with God through preaching to arouse the audience’s faith. Paul illustrated Deuteronomy 30:14 according to the MT version. There is a difference between the MT and the LXX version: the LXX added “and on your hands.” The author of the LXX might want to emphasize on the relationship between faith and deeds to express one’s faith. To Paul, people must believe Christ in their heart and proclaim in their mouth that he was sent by God to people, died and resurrected, in order to attain salvation. (1) Jesus’ temptation: The devil knew that Jesus is about to begin his mission to bring people back to God; through this temptation, the devil wanted to advise Jesus the way to conquer people: They shall follow you if you provide them with bread, not by fasting. In Luke’s Gospel as in all other three Gospels, there was a miracle which Jesus multipled bread and fish to feed five thousand men alone; but he refused to conquer people by feeding them. He want to conquer them by preaching the Gospel and by revealing God’s love for them. Moreover, Jesus corrected people when they looked for and made him their king: “Do not work for food that perishes but for the food that endures for eternal life, which the Son of Man will give you. For on him the Father, God, has set his seal” (Jn 6:27). (2) Human temptation: The devil often use food and drink to tempt people everywhere and in all generation: Eve and Adam in the garden; the Israelites during their forty years in desert and people of our time. He is very successful when using this trick, not only with those who are hungry and poor but also to all people. Because of their unlimited greed, people aren’t content with “the daily food,” but desire to have food for their entire life and the life of their children. In order to satisfy their excessive greed, people spend lots of time to work and have no time to study God’s word nor to meet their soul’s needs. The reason why people can easily recognize the bodily hunger is because it disturbs their body and threatens their life. They don’t recognize the need of their soul because it doesn’t immediately lead them to death; but it shall gradually does it by careless decisions. More importantly, it shall lead them to the spiritual death forever. Jesus’ word today reminds us an important truth: As our body needs food, our soul also needs to be fed by God’s word. (1) Jesus’ temptation: Besides food and drink, people are easily fell into the devil’s temptations of material things, vainglory and power. The devil implicitly suggested Jesus in this temptation: People shall follow you if they are satisfied with these things; not to give up everything and to carry the cross as you planned. The devil is also very successful with this trick: with Eve in the garden, with Jacob’s children. In the Gospel, three times when Jesus foretold his Passion and Death to his apostles, three times they proved that the devil’s temptation is what they were looking for. However, Jesus was still patient to teach them to give up everything, to serve everyone and to carry the cross to follow him. (2) Human temptation: We can recognize the devil’s shrewdness in this second temptation because all these things don’t belong to him, but to God alone. He created all things for people to use as long as they live in the world. People don’t bring anything when they enter into the world and don’t take anything with them when they leave the world. The devil knows people’s greed of possession, so he promises to give people things which don’t belong to him. In reality, countless of people fell into his trap; they chase after fake promises and worldly vainglory and forget about God Who created all things. 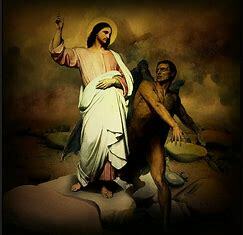 (1) Jesus’ temptation: The devil knew that people like easy ways and avoid sufferings, so he convinced Jesus to conquer people by performing miracles. In all the Gospels, people followed Jesus to ask him to take away their suffering and sickness. He healed many people with an intention to rouse up their faith, not as the way to conquer people. When Jesus was dying on the cross, this temptation was put on the mouths of the chief priests with the scribes and elders who mocked him and said, “He saved others; he cannot save himself. So he is the king of Israel! Let him come down from the cross now, and we will believe in him” (Mt 27:41-42). (2) Human temptation: God can take away all human sufferings; but if He does so, people can’t show their faith or advancement of faith. Trials and sufferings are the opportunities for people to train their faith and to show their faith in God. - We are living on the beginning days of the journey of Lent. The purpose of Lent is to train us to be firm in our faith so that we can overcome all the devil’s and the world’s temptations. - If we don’t take advantage of Lent to train our faith, we can’t overcome temptations of three very dangerous enemies which are the devil, the world and our flesh.